At Willard Veterinary clinic, our primary concern is for the health and well being of your cat. Unfortunately, there may arise a circumstance when a surgical procedure is in the best interest of your feline friend, and in these times you will need to make that decision. We understand what that feels like, and our veterinarians and staff are here for you too. If a cat surgery is being recommended, our veterinarian will have sound medical reasoning and it is important that you understand what surgical procedure is being recommended and why, how the procedure will be performed and when it should take place. There are two categories of cat surgeries, elective and urgent/emergency. Elective surgeries are performed when your cat generally considered healthy, thereby greatly reducing possible complications. However, today even urgent cat surgeries carry significantly lower risks due to improvements in modern medicine and vast improvements in the standards of veterinary care. Thanks to an extensive list of pre-surgical procedures such as exams, premedication, introduction of fluids, pain control and monitoring of vital signs; as well as improved protocols during surgery including high level monitoring equipment of vital signs such as body temperature, heart rate, blood pressure, CO2 levels, oxygen levels and a knowledgeable anesthesiologist all serve to reduce the risks associated with cat surgeries. Pre-surgical assessments. Prior to surgery, the veterinary team verifies the specifics of the procedure; completes a physical exam of the patient; and ensures blood tests have been completed, documented, and reviewed by the veterinarian. Among other things, these precautions help determine if your pet is at risk for complications while under general anesthesia. Dedicated surgical suites. To prevent post-surgical infections and cross-contamination, surgeries are performed in a room used only for sterile surgical procedures. Surgical attire. Staff must wear disposable caps and masks when entering the surgical suite. Anyone involved in the procedure itself must also wear sterile gowns and single-use gloves. Sterile packs and equipment. Surgical instruments are carefully cleaned, sterilized, and wrapped prior to each procedure to help prevent infections. While the decision to have your cat undergo surgery is completely in your hands, our veterinarians will do their best to make sure your feel supported with information to make the best decision. We are here to help you make an informed and compassionate decision that is in the best interest of your cat. We recommend that you fast your cat the night before surgery but allow them to drink water through the night. Generally, this involves simply picking up your cat's food but allowing them access to water til you depart for the veterinary hospital. Be on time for your feline surgery, There is an important pre-surgical process that requires your cat be in the hospital when scheduled. 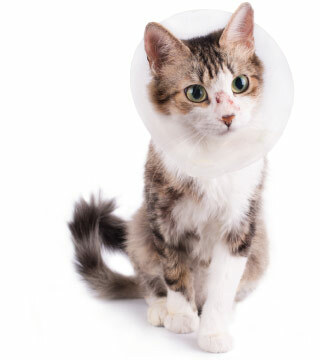 Listen carefully to post surgical instruction from your veterinary care team and call the hospital if you have any questions regarding the post op care for your cat. Safe cat anesthesia requires that close attention be paid to the patient before, during, and after the anesthetic. At Willard Veterinary clinic, we treat every cat according to its specific medical and surgical needs. Each anesthesia is tailored to each patient. We adhere to very stringent guidelines for administering cat anesthesia before, during and if necessary, after surgery. These guidelines come from the American Animal Hospital Association, a veterinary organization that only accredits approximately 12% of all veterinary practices nationwide. For example, the AAHA guidelines require that we first do blood work, and then depending upon your cat's overall health, other tests to ensure there is not an overt risk of complications from receiving cat anesthesia. Cat anesthesia is extremely safe when the patients are stabilized before the procedure and all effort is made to have a good understanding of the cat's medical condition before surgery. There is always some risk to anesthesia, however, the risk is extremely low when being performed by a highly qualified veterinarian and surgical team. Review with your veterinarian any feeding and/or comfort tips they can provide depending on what kind of anesthetic was used, and what surgical procedure was performed. Always remember to call us if you have any questions about your cat's recovery. The changing of bandages, care of stitches, etc. Suture care (stitches): Most surgeries will require some sutures. Your veterinary staff will review you the after-care which will include keeping the cats from licking the incision. If you need to discuss surgical options, or schedule surgery for your cat, please contact us today. Our veterinary staff is highly experienced and are caring cat people who are happy to help ease the stress and fear associated with cat surgery for you and your feline friend.